Latex is suitable for coating gloves because it has an outstanding grip, high elasticity, it is tear resistance and it can withstand extreme temperature. There are very many types of latex coated gloves. 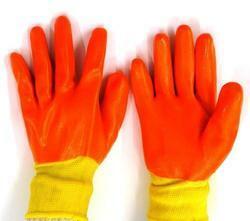 Most latex coated gloves are classified according to the material that makes them i.e. nylon, cotton, polyester e.t.c. Below are some of the most common latex coated gloves. 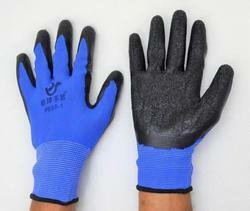 As the name suggests, these latex coated gloves are made of nylon and then coated with latex on the palms. The gloves have impressive features i.e. they are lightweight and breathable for all day comfort. They also have an outstanding grip in both dry and wet conditions. As the name suggests, these latex cated gloves are made of polyester and then textured with latex. The main aim of the latex coat is to offer an excellent grip in wet and dry conditions. Unlike the nylon gloves with latex textured palms, these gloves are better in terms of resistance to puncture. 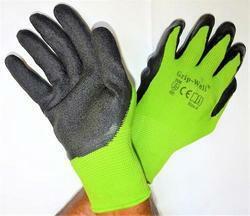 The gloves are also used in agriculture and automotive industry applications. 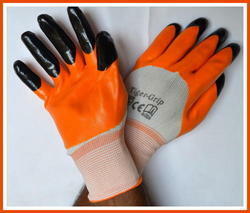 Gloves made Nylon fibre coated with crinkle latex are cut and abrasion resistant. 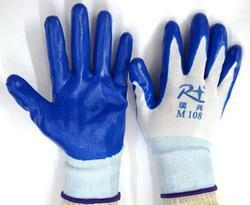 Latex gloves are gloves made from naturally occurring rubber latex and they are used in a variety of fields. These gloves have been used in the medical field for decades, due to the fact that they are sanitary, they are easily disposable, efficient and very affordable – besides, they have a minimal impact on the sense of touch, thus allowing health care professionals to carefully inspect patients for an accurate diagnose. Basically, latex gloves are a great choice in every situation where you want to protect your hands against infections or direct contact with food, chemicals or bodily fluids. In a nutshell, latex is a milky fluid that contains rubber hydrocarbon along with other substances such as proteins, carbohydrates, water or sugar – when it hardens, it can become extremely stretchable and durable. Latex is used for manufacturing a myriad of products, from gloves and balloons to baby soothers. Despite the fact that latex gloves are very popular nowadays and they are used in many different fields, many people are allergic to latex – for those who are hypersensitive to rubber, there is always the nitrile alternative which is hypoallergenic. However, it must be mentioned that most nitrile gloves are not as flexible as latex gloves are, and they do not provide the same tactility and stretchability. 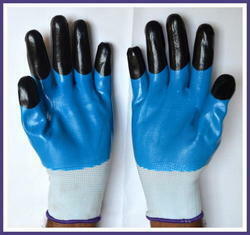 We are offering Latex Coated Gloves to our clients. 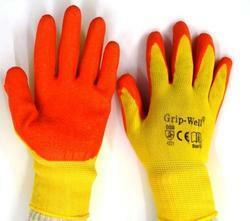 The gloves made from Nylon or Polyester Yarn makes the gloves lighter, flexible & comfortable to reduce hand fatigue. The natural Latex double coating in Sandy finish offers superior grip in wet, dry & oily Conditions. Nylon or Polyester liner also makes it exceptional comfortable & reduces hand fatigue. The back open allows breathability. Sandy Finish Coating offers maximum comfort & minimum fatigue. The Cor-Grip was Machine Knit from a Poly-Cotton Blend, using 10 Gauge yarn. 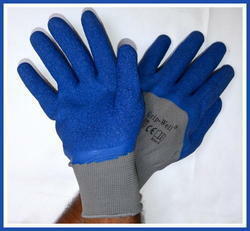 This makes the glove strong and durable, but also formfitting and comfortable. It can resist many types of abuse, from cuts to tears to punctures. It is also food safe, and can be used in a food contact application. The gloves are available either in powdered or non-powdered form – powdered gloves make it easier to put the gloves on and to take them off, although it may create allergy in some cases. The ultimate purpose of the glove is to provide superior manual dexterity. Powdered gloves are dipped in cornstarch, as it is non-irritant, pure, highly absorbable and it does not affect the glove quality in any way. Nonetheless, powder-free gloves tend to be slightly more expensive as the manufacturing process is more complex if they do not have a cornstarch coating. Medical latex gloves split into two categories: surgical latex gloves (which are sterile and used in the operating room) and examination gloves (non-surgical gloves used for examining the patient). Regardless of the type of glove or application, latex gloves are known to have the highest protective properties compared to similar gloves – they are stronger, thicker and considerably more elastic than many other options. The beaded cuff, on the other hand, is another handy feature, as it prevents the glove from rolling back during the operation. Great for Recycling, Drywall, Roofing, Lumber, Construction, etc. Crinkle-finish provides a great grip in wet or dry situations. Red Nylon Shell With Black Crinkle Latex Palm Coated Gloves As the name suggests, these Red Nylon Shell With Black Crinkle Latex Palm Coated Gloves are made of polyester and then textured with latex. The main aim of the latex coat is to offer an excellent grip in wet and dry conditions. 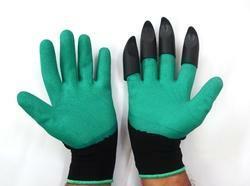 Unlike the nylon gloves with latex textured palms, these gloves are better in terms of resistance to puncture. They are Red Nylon Shell With Black Crinkle Latex Palm Coated Gloves used for applications such as; construction work, material handling, small parts handling, masonry work, landscaping and maintenance work. 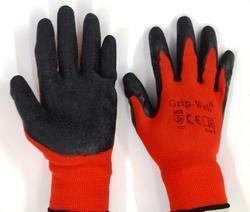 The gloves are also used in agriculture and automotive industry applications. We are offering Yellow Cotton Yarn Knitted Gloves to our clients. 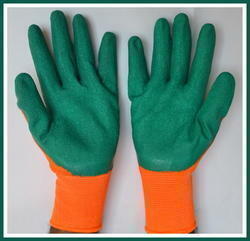 The gloves made from Nylon or Polyester Yarn makes the gloves lighter, flexible & comfortable to reduce hand fatigue. The natural Latex double coating in Sandy finish offers superior grip in wet, dry & oily Conditions. Nylon or Polyester liner also makes it exceptional comfortable & reduces hand fatigue. The back open allows breathability. Sandy Finish Coating offers maximum comfort & minimum fatigue. 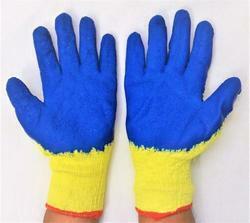 We are offering Yellow Cotton Yarn Knitted Latex Gloves to our clients. 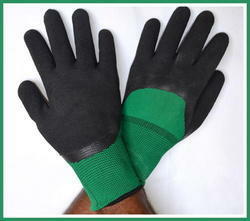 The gloves made from Nylon or Polyester Yarn makes the gloves lighter, flexible & comfortable to reduce hand fatigue. The natural Latex double coating in Sandy finish offers superior grip in wet, dry & oily Conditions. Nylon or Polyester liner also makes it exceptional comfortable & reduces hand fatigue. The back open allows breathability. Sandy Finish Coating offers maximum comfort & minimum fatigue. 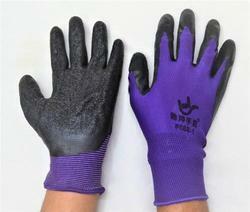 These latex coated gloves are made of a combination of nylon and cotton. They are the best gloves for vibration dampening because the combination of nylon and cotton produces a very thick and strong glove capable of absorbing and dampening strong vibrations. 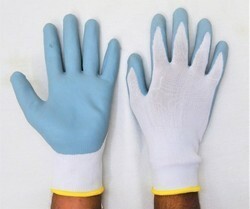 Nylon/cotton latex coated gloves are highly flexible which means that they don’t impede hand movement. The layer of latex on the palms makes the gloves puncture resistance and offers a tight grip for wet and dry handling conditions. The gloves are popular in the mining and oil & gas industry because these industries are associated with strong vibrations. In summary, it is important to note that there are many other types of latex coated gloves in the market. The above types are however the most common in the market today. 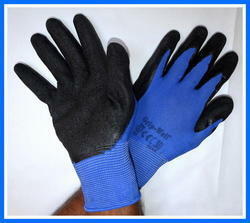 We are offering Blue Nylon Shell With Black Crinkle Latex Palm Coated Gloves to our clients. 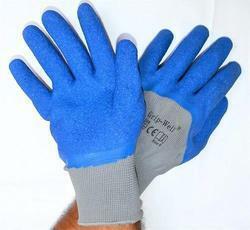 The gloves made from Nylon or Polyester Yarn makes the gloves lighter, flexible & comfortable to reduce hand fatigue. The natural Latex double coating in Sandy finish offers superior grip in wet, dry & oily Conditions. Nylon or Polyester liner also makes it exceptional comfortable & reduces hand fatigue. The back open allows breathability. Sandy Finish Coating offers maximum comfort & minimum fatigue. We are a Green Nylon Shell With Black Crinkle Latex Three Fourth Coated Gloves in the industry for trading an exclusive range of Green Nylon Shell With Black Crinkle Latex Three Fourth Coated Gloves. 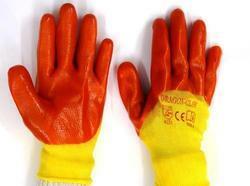 Para Aramid Seamless Gloves combined with Crinkled Finish Latex Coating for secured grip in wet & dry condition. 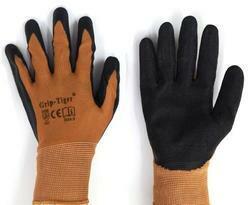 These gloves also provide excellent cut, abrasion & puncture resistance. Open Back for more air circulation & soft Para Aramid Lining for non irritation for long periods of wear.
. These products are fabricated using the top quality fabric that is sourced from reliable vendors of market. Experts make this product in varied patterns that meet on customers demand. Skillful experts use the optimum quality input to make this product as per industry norms. As the name suggests, these latex cated gloves are made of polyester and then textured with latex. The main aim of the latex coat is to offer an excellent grip in wet and dry conditions. 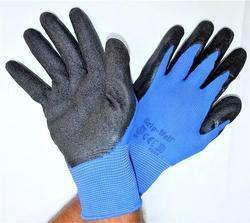 Unlike the nylon gloves with latex textured palms, these gloves are better in terms of resistance to puncture. They are used for applications such as; construction work, material handling, small parts handling, masonry work, landscaping and maintenance work. 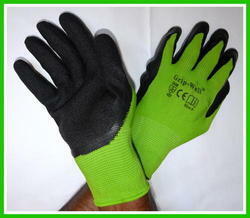 The gloves are also used in agriculture and automotive industry applications. , our company has established its name very strongly in the market. These gloves from our side have been designed to provide protection to hands during a variety of applications. These are available in a number of sizes and colors and are extremely easy to fit. These are provided at industry leading rates. 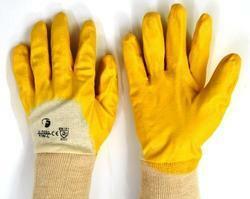 Latex Dipped Gloves made on yellow color polyester. The gloves made from Grey Nylon Shell With Orange Nitrile Three Fourth Foam Gloves makes the gloves lighter, flexible & comfortable to reduce hand fatigue. The natural Latex double coating in Sandy finish offers superior grip in wet, dry & oily Conditions. Nylon or Polyester liner also makes it exceptional comfortable & reduces hand fatigue. The back open allows breathability. Sandy Finish Coating offers maximum comfort & minimum fatigue. As a prime wholesaler, supplier and trader of Latex Dipped Gloves, our company has established its name very strongly in the market. 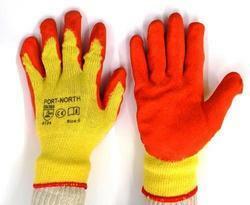 These gloves from our side have been designed to provide protection to hands during a variety of applications. These are available in a number of sizes and colors and are extremely easy to fit. These are provided at industry leading rates. 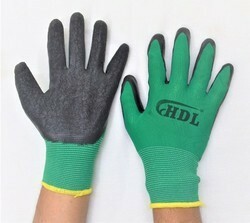 Latex Dipped Gloves made on yellow color polyester. As a prime wholesaler, supplier and trader of White Nylon Shell With Orange Blue Three Fourth Dipped, our company has established its name very strongly in the market. These gloves from our side have been designed to provide protection to hands during a variety of applications. These are available in a number of sizes and colors and are extremely easy to fit. These are provided at industry leading rates. White Nylon Shell With Orange Blue Three Fourth Dipped made on yellow color polyester. under the dry , wet and oily conditions. to the material being handled. It's the one step solution to handle a variety of gardening tasks. 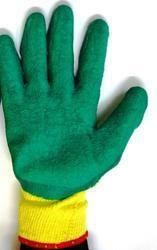 Garden gloves rinse clean and don't hold dirt leaving your hands dry, clean & protected.